As a leading expert in the field of orthopedic surgery, Steven Meier, MD, is actively involved in the education of physicians and healthcare providers around the world. In May of 2010, Dr. Meier traveled to Cairo, Egypt to share the latest minimally invasive innovations of orthopedic surgery with one of the world’s oldest civilizations. Dr. Meier, a Beverly Hills orthopedic surgeon, traveled to the Helmia Hospital and Medical Center in Cairo with his humanitarian foundation “Arthroscopy Worldwide”. 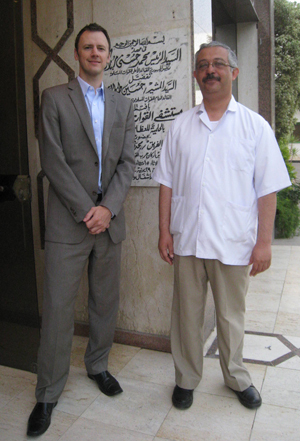 As a guest of the Egyptian government, Dr. Meier was encouraged to perform patient consultations and utilize his expertise of the latest minimally invasive arthroscopic techniques. A collegial atmosphere was maintained throughout the trip as Egyptian surgeons traveled from surrounding areas to observe Dr. Meier and assist in some of the surgical cases. Since Helmia Hospital is a government-owned healthcare facility, a significant percentage of patients were members of the Egyptian military. Many of these patients had sustained common athletic injuries and required treatments such as anterior cruciate ligament (ACL) reconstruction of the knee and arthroscopic shoulder instability repair. Other injuries encountered by Dr. Meier and his team included tears to the posterior cruciate ligament (PCL) and lateral collateral ligament (LCL), meniscus and cartilage injury requiring osteochondral graft transfer for cartilage restoration, and rotator cuff tears requiring arthroscopic repair. 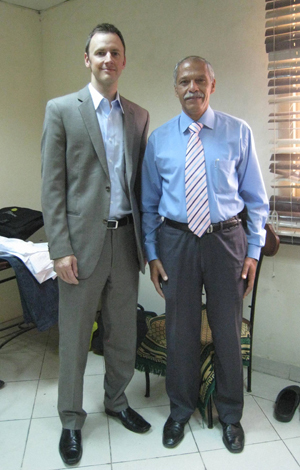 This marked Dr. Meier’s second outreach trip to Egypt through Arthroscopy Worldwide. Upon returning to Cairo, Dr. Meier noted numerous improvements and technological advancements that had been implemented since his first visit six years before. “The improvements that we recommended for surgical equipment after the last visit have enhanced the ability to perform minimally invasive surgery substantially. Particularly the arthroscopic fluid pump systems which help to regulate saline pressure and flow which is so important for visualization during arthroscopic procedures. Introducing all-arthroscopic procedures during the last visit was very difficult due to fluid management inconsistencies. The improvements in equipment, however, made it possible to possible to perform the most advanced all-arthroscopic reconstructions during the recent visit,” said Dr. Meier. In his more recent trip, Dr. Meier introduced several new concepts to the repertoire of the local surgeons. Most notable were the performance of shoulder instability repair in the lateral position with the arthroscope in the superior portal and a “balanced repair” of the inferior glenohumeral ligament with emphasis on anatomic repair (Meier et al. “Anatomic Repair Optimizing Biologic Healing Potential”). Additionally, Dr. Meier introduced a novel technique for ACL reconstruction surgery involving the anteromedial portal for anatomic placement of the femoral and tibial tunnels. Over the years, ACL reconstruction has become increasingly common in Egypt and is a common procedure performed on football (known as soccer in the U.S.) players and other athletes. Beverly Hills Orthopedic Surgeon Steven W. Meier, M.D. Steven Meier, MD is a board-certified orthopedic surgeon with fellowship training in sports medicine and advanced arthroscopic procedures. As a leader in the field of orthopedic surgery, Dr. Meier offers a number of innovative, joint-preserving therapies for the treatment of sports-related injuries. To learn more about Dr. Meier’s practice or to schedule an initial consultation, you may contact us by calling 310.736.2793.